Happy Halloween from the FreePBX/Schmooze Com Team! All are welcome to the first FreePBX user meetup which will take place at The Nook tavern in Huntsville on Friday, November 8th. We will be hanging out from 7pm until “whenever”. Whether you are the most neo of neophyte or a seasoned admin, all are invited to enjoy one of over 450 beers that the Nook has to offer, and hang out with fellow FreePBX users along with Derek Peloquin, FreePBX Community Manager and Rusty Newton, Asterisk Community Support Manager. Schmooze Com Inc., maintainers, core developers and stewards of the FreePBX project are excited to announce the FreePBX High Availability Project. This is an easily implementable, replicable and supportable High Availability version of FreePBX for license by organizations that need a reliable High Availability solution. 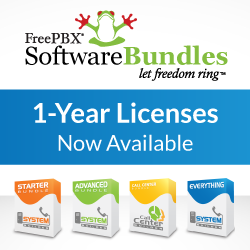 View this Video to learn more about this exciting new product from the team that brings you FreePBX, as well as details about our 25% off Pre-Release Promotion, available until October 31, 2013. Managing Disaster Recovery is a difficult and complex task to achieve. Major system outages can be caused by hardware, software, connectivity, natural, human, or other means. Now, FreePBX HA is there to help you ensure the recoverability of your systems. To make this happen, we are reworking the FreePBX platform to integrate HA utilizing DRBD, Cluster Manager and Pacemaker. This enables automatic mirroring and failover between FreePBX nodes. When a failure condition is detected on your primary PBX, the system will failover to the secondary. Then when the primary node is repaired or recovers, the system will be able to switch back to the primary FreePBX node. Setup of HA is simply done in the FreePBX GUI where you can also use an online management tool to easily switch between nodes.Lastly, you’ll be able to setup different levels of monitoring and alerts you want to receive in the event of a problem. Until October 31st we are offering a pre-release special of FreePBX HA that includes two node licenses for $2,250. Upon final release we estimate the cost of two licenses to be at least $3,000. So, by taking advantage of this promo you will be getting a 25% discount! Pre-release buyers will also receive access to private BETA releases and HA development team conference calls. We anticipate the first private BETA will be released for testing during November 2013. To participate in this pre-release promotion, please contact us using our “Contact Us” page.